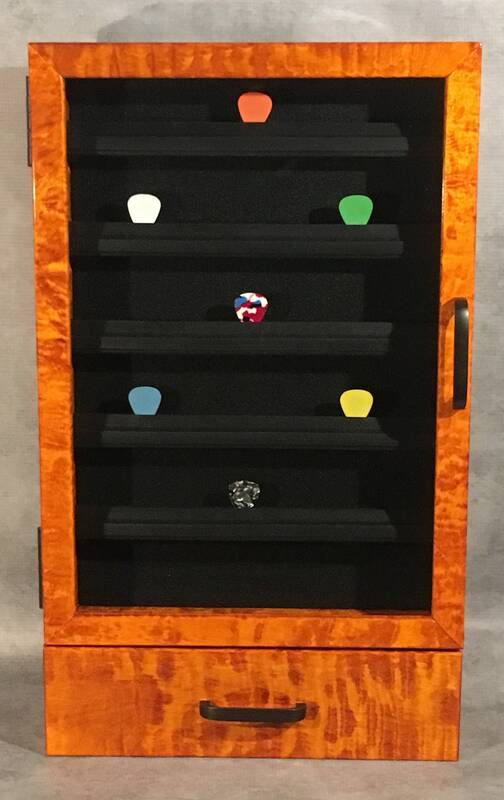 This guitar pic collection case is very unique in a few ways. First and most noticeable is the amazing look of the solid tiger maple it is made from. With the beautiful stripes and eye catching 3-D look of the wood, it is an instant conversation piece, before you even notice the cool guitar pics you have displayed in it. It is dyed with Amber Transtint dye and finished off with 4 coats of a gloss polyurethane. Secondly, it is the only case, that I am aware of, that is made like this. I custom designed this for a client some time back and have tweaked the design and used the wood that so many guitar players love for their own guitars - tiger maple. It has magnets set in the door frame and case frame that secure the case closed. It is mounted to the wall using included harware. This is a prototype I am working on that will result in a batch of them being made of different colors - red, blue, green, and more amber cases like this one. Because it's a prototype there are some imperfections that exist on this case, that will be eliminated once I make the batch of cases to come. I'm also going to sell this case for the cost of materials, shipping and listing fees. It is beautiful regardless, but the flaws listed below will give someone a chance to buy a beautiful case for cost and display it and their collection without most people even noticing any of the flaws. Flaw 4 - is really not a flaw but after assembly I wasn't happy with the drawer, In my opinion it is too bulky and because it is so shallow it will come out of the case completely when opening it up in full. I will have a re-designed drawer on future models. Cost - the materials for the case totaled $140 (wood, Dunlop guitar pic holders, dye, polyurethane, glass, felt and door/drawer/hanging/hardware). Fees will amount to about $15 for listing it, selling it and Paypal's cut. Shipping will range from about $40 -$70 depending on where in the country it is going. So, I'm listing the cost as $210 if turns out to be less because of shipping I will refund the difference. If it amounts to more I will leave it at $210. 5 - 12 inch Dunlop rubber mic stand pic holders, trimmed to size, can hold up to 55 pics. Please send questions or comments to al@harvestwoods.